Free! Verve-Latte Love Digi Set! Hello Friends, I had a terrific time on Sunday getting crafty while it was raining outside. I just love when the weather works out according to my plans, so I don’t feel guilty about being in my studio when it’s nice outside. Today’s post is pretty chock full, so please bear with me! 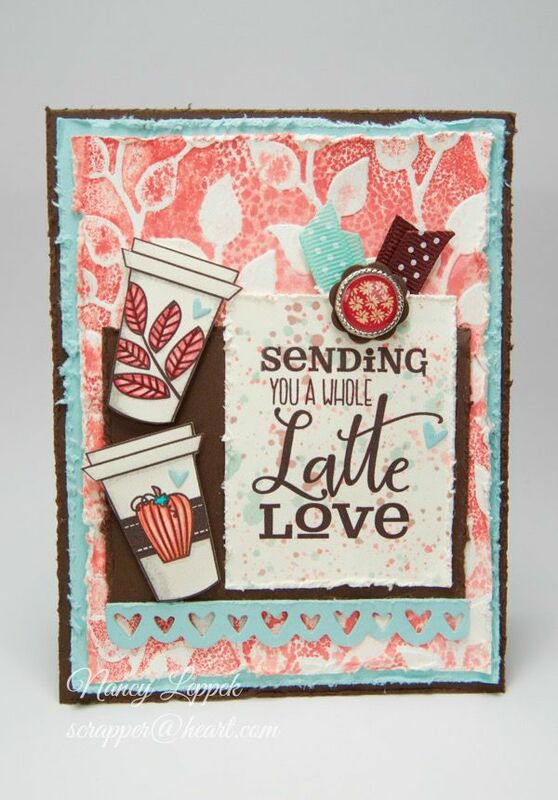 Julee Tilman over at the Verve Store has this Fabulous FREE Latte Love Digi Set for all of us to enjoy! Don’t delay, as it is only available for a short time. Thanks Julee!!! I absolutely love it and couldn’t wait to print it out and get to work. I am linking this card up to quite a few Challenges! The first is the Verve Inspiration Challenge for the month of September. Next, is for the 4th Viva la Verve Sketch of the month. Next, is the Fall Coffee Lovers Blog Hop, that I am sure you have run into in blog land recently. And last but not least, I am back playing again this week with Just Add Ink where they asked us to use our 3 favorite colors. This is definitely one of my all time favorite combinations! I looked at all the rules and regulations on all of the Challenges and I don’t believe I have violated any of them by linking to 4 challenges, at least I sure hope not! Here are a few Card Details and another view of my card: I used water colored paper and and inked up and spritzed water on my Embossing Folder to get the effect I was looking for the background leaf paper. I colored the coffee cups with my Prisma Colored pencils. I spattered the same 3 colors of ink onto my sentiment panel. The heart die is also from Verve and is a must have! I distressed all the edges with my SU distresser. Added the ribbon and the button brad to finish it off. Excuse the ribbon….. I had it adhered them both to my card in two continuous loops and didn’t like it at all. So I decided to cut them while they were already in place, which explains why they are so short and are clearly the back of the ribbons, as there are no dots showing on parts of them. Epic fail there! Other then that….Love…..Love my card! Categories: Cards | Tags: Card making, Cards, color challenge, friendship, love, rubber stamps, stamping, Stamping Up, Thinking of you, Verve Stamps | Permalink. Wonderful coffee related card design. Great colors. Such a fun card! Great job Nancy! Oh WOW Nancy this is awesome. So many gorgeous details to gaze over. Everything just marries together beautifully. Simply love it. Such a beautiful card, Nancy!! I love the colors you used and that background is GORGEOUS!!! Eek how cute. Love the boarder. this is so cute, love that background!!!! Your embossed BG is so perfect for this beautiful creation and wonderful color choice, love it! Love your card, Nancy, and thanks for sharing the download file. I don’t have any coffee stamps to use for the blog hop. Gorgeous colors! Love the digital images too! Great card! Such a pretty colour combo that I never would have thought to use! Another pretty card, Nancy, lovely colors a well! Happy hopping! LOVE your PRETTY distressed layers, LOVE the design & colours, GREAT way to use the freebies!!! 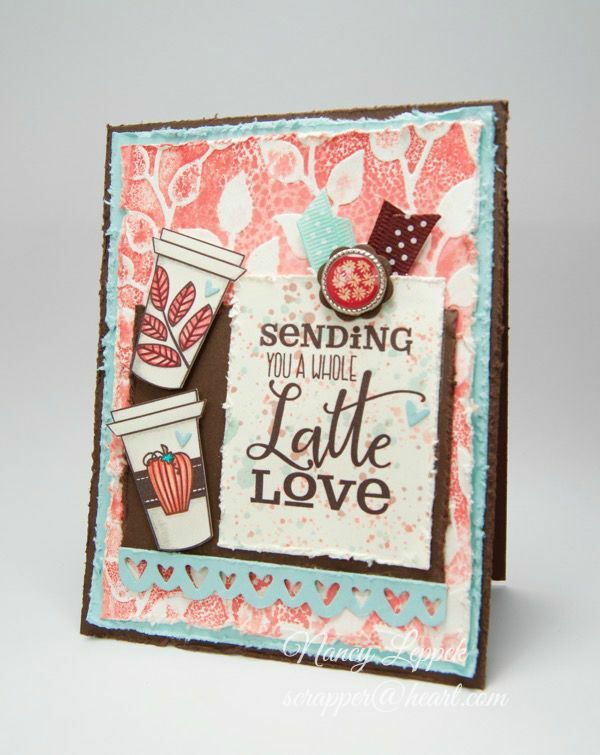 Love the watercolour leafy background you created Nancy – adds so much texture and a real rustic touch that ties in wonderfully with your coffee cups. Thanks for sharing this with us at Just Add Ink this week. Hey, I love your color combo. Diffinately a Florida influence. Great composition too with the textures and rugged edges. pretty colors and sweet coffee cups on this! Stunning card! Love the background … been wanting to try this technique. I love all these pretty details on your card! Perfect for fall! This is fun! Thanks for the heads up on the freebie. I just picked it up. Love the wonderful colors you used. This really is such a beautiful color combo and fantastic elements to complete the sketch! Well done! Wow, this card is simply gorgeous!!! This is gorgeous! I’m surprised you were able to get the watercolor paper through your printer! Such an awesome card! Nancy, this is GORGEOUS!! Fabulous colour combo, and I love that you splattered all three colours on the sentiment panel. 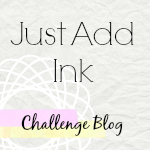 Thanks for entering your beautiful card in our Just Add Ink challenge this week. I love the leaf background – such a cool effect! Thanks for playing along with us at Just Add Ink this week. This is amazing!!! I cannot wait to play this weekend with that digi!!! It is so cute!!! Love your bold design! Fantastic card in fantastic colors. Love the effect of the watercolors with the ef! And I don’t see any fails whatsoever with the ribbon! Looks great to me!! Oh so pretty! The watercolour background looks wonderful, very pretty colour combination, and the brad is a fine finishing touch! LOVE everything about your card!! Thanks so much for the inspiration! This is so pretty! I love the colors and the way you did the background… the die… the distressing is fantastic… love it! Love the distressing of your card, the colors and the background inking. Great card.